This PDF 1.4 document has been generated by Acrobat PDFMaker 8.1 for Word / Acrobat Distiller 8.1.0 (Windows), and has been sent on pdf-archive.com on 30/08/2011 at 12:10, from IP address 218.231.x.x. The current document download page has been viewed 1000 times. File size: 1.2 MB (179 pages). truth asserted by the human intellect is adequated to or conforms to some res. ceased to exist almost four hundred years ago and still this proposition remains true. God, such as his power or essence, grounds necessary propositions about creatures. even after the creatures that they are about (and their forms) have perished. “Amicitia, quanto maior, tanto est firmior et diuturnior. provided me with a sound foundation for further study of Aquinas’s thought. philosophy through his courses and in his dirrection of my PhD candidacy exams. dedication that he shows to his students as I begin my teaching career. interesting email exchanges and coversations about Aquinas, truth and modality. particularly like to mention Jennifer and Drew Rosato. existing being to which the intellect can conform when it knows a necessary truth. *All translations are my own unless otherwise noted. See, for example, In I Sent. 19.5.2, ad 2.; De ver 1.1 co.
the intellect conforms, the being of God, cannot fail to exist or be just. relation with the human intellect when it knows a necessary truth. ago when dodo birds became extinct. exception since it is created by God, but incorruptible. Review of Metaphysics 47 (1993): 48-62.
and his positions on related ontological issues. See, Resp. 4ae, VII, 235.5-14.
existing being, it must be determined how this res is related to God. See, for example, his Monadology par. 43-46.
world (Cambridge, 1994), pp. 134-5.
grounded in the contingently existing essences of created beings. 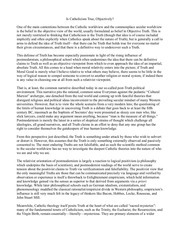 Armand Maurer, &quot;St. Thomas and Eternal Truths,&quot; Mediaeval Studies 32 (1970): 91-107. Medieval Philosophers, (Toronto: PIMS, 1990). existence belonged to these essential principles from which necessity arises. 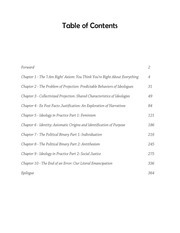 In the third chapter, I will provide an overview of Aquinas’s thinking on truth. propositions depended on existing things. foundation for necessary truths about creatures is the unicity of substantial form. ontological ground for propositional truths about creatures. why the essential attributes of creatures are necessarily joined together as they are. discuss the difference between necessary accidents and essential features on pp. 32-33. Foundations of Modality and Conceivability in Descartes and His Predecessors,&quot; in S. Knuuttila ed. Synchronic Contingency,” The Modern Schoolman 72 (1995): 149-167.
about events. Modal and Tense Analysis in Medieval Logic,” Vivarium 21:2 (1983): 85-107 and H.
Goris, Free Creatures of an Eternal God, (Leuven: Peeters, 1996), pp. 260-265.
proposition clearly violates the principle of non-contradiction. interpreting modal terms, they in fact held no modal theory at all. De Int. 1.14, n. 8.
the class of that which is possible cannot be coextensive with that which is contingent. time and not at another would give proof that the thing's occurrence is contingent. Naturgeschehnisse,&quot; Studia Mediewistycne, 18,:2 (1977): 3-70. Aquinas accepted that an eternally created world is possible. See his “Aquinas on God and Modal Truth”. discussing, we get Aquinas's own view on what the best account of modal terms is. is an irreducibly basic feature of its essence. there are a number of different respects in which something is unable not to be. See for example ST Ia.82.1 co.: &quot;necesse enim est, quod non potest non esse&quot;; In. III Sent. whether grace and the sacraments are necessary for the beatific vision (In II Sent. necessity that arises from an agent or efficient cause with the necessity of coercion. cross the sea in the latter way. See, for example, In III Sent. 20.1.1 qc. 3 co. and ST IIIa.14.2 co.
the “natural” applies to some part of this class and the “absolute” applies to the other. ambiguity in whether the term &quot;natural necessity&quot; should be taken to refer solely to material necessity. necessity' that is the same as this sense. and vice versa, there are certain texts that appear to present a challenge to this view. entailed the essence of a human being, however, no human being is able to do this. impossible2 is not absolutely impossible and its opposite is not absolutely necessary. included in or entailed by a property of a being’s essence. contrasting it with extrinsic necessity. See, for example, De pot. 1.3 ad 9.
is causally entailed is caused by an intrinsic or natural principle or an extrinsic cause. occurrence and includes that which is caused by either intrinsic or extrinsic causes. human being, then it is necessary for him to will certain other things to be. absolute necessity arises in creation. there is no subject from which their form can be separated in a process of corruption. essential principles in the sense of arising from the parts of these essential principles. view, which will be discussed below, that matter enters into the definition of a material being. On the distinction between the form of the whole and the form of the part see, for example ScG IV. properties included in its form or essence, which is signified by its definition. flesh and blood, however, were necessary. 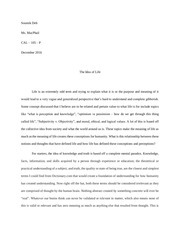 sources see Armand Maurer, &quot;Form and Essence in the Phiosophy of St. Thomas&quot;, 13 (1951): 165-176.
philosophers, but it is also a position which can be contrasted with the popular contemporary view. essential properties of a being. Accidental,” Ratio 18 (2005): 276-89.
comment on this apparent inconsistency. distinction is relevant for understanding how necessity arises from agent causes. likewise necessary to their subjects because they follow from their essences. like understanding, and actions that produce effects in other beings, such as heating. to occur, it occurred necessarily when the appropriate conditions for it obtained. actually heat anything; however, it would still necessarily have the power to heat. logically necessary when the appropriate conditions obtain. voluntary agent, Aquinas thought there was an element of necessity of the end. chooses its actions for the sake of its final end, which is happiness. depending on its matter form composition or lack thereof. respect to the essence of man) are necessary to it. entialed by rationality) are necessary to it. burn) are necessary to created beings. 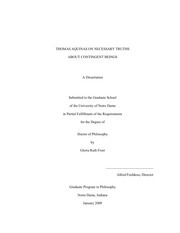 dispositions that are necessary (e.g. cotton’s being burned by fire). matter and form of creatures, which together comprise their essences, have existence. De pot. 3.5 ad 2.
the nature fails to have any existence. This file has been shared by a user of PDF Archive. Document ID: 00033339.